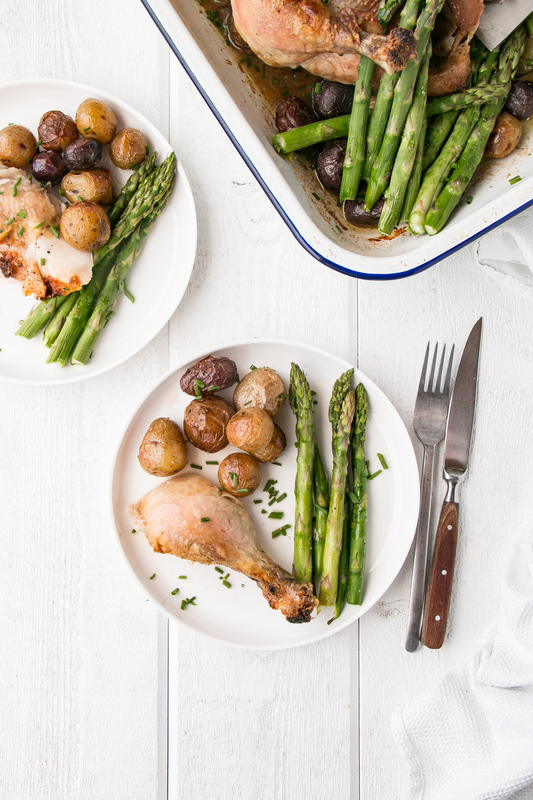 Easy and with almost zero prep, this 4-Ingredient Roast Chicken Dinner is sure to become a new family favourite. 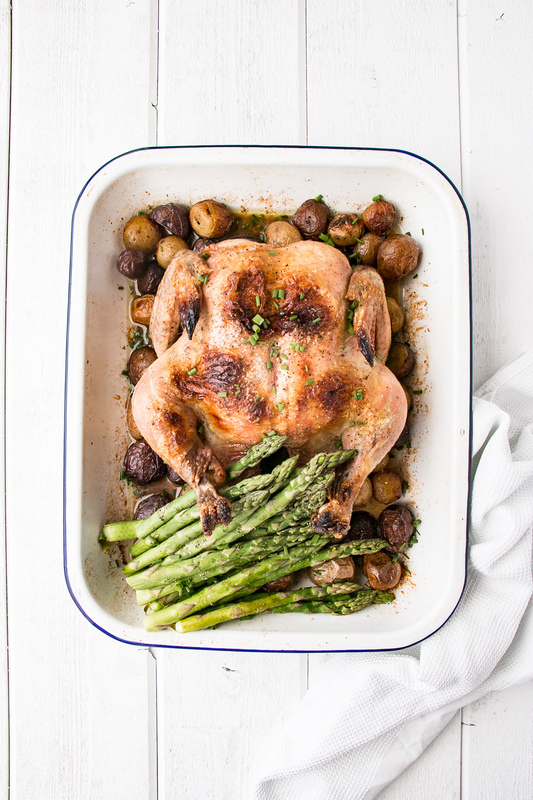 A fail-proof juicy whole roast chicken recipe that lets the oven do all the work! This is one of our favourite dinners that gets repeated with obscene frequency. 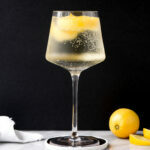 Plus, it’s what I love to serve at larger dinner parties because it’s so simple, yet juicy and flavourful that everyone loves it. 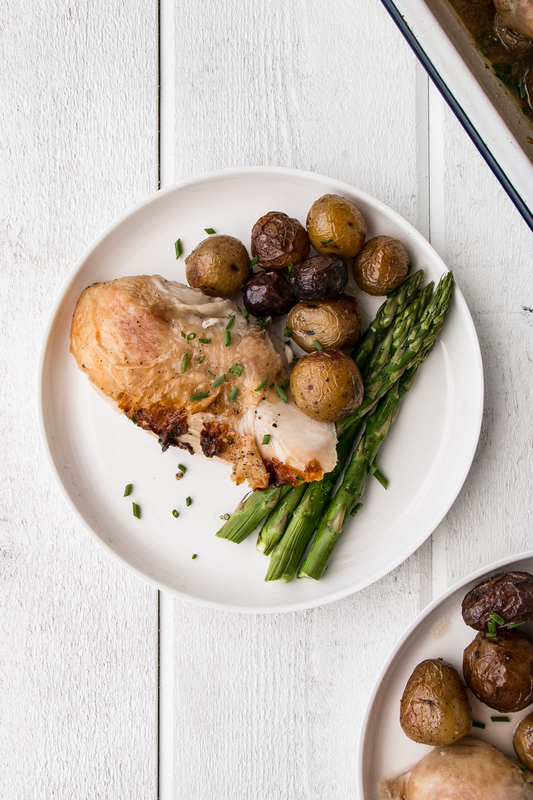 This 4-Ingredient Roast Chicken Dinner is a one pan meal that requires virtually zero prep. It’s also guaranteed to have leftovers after a weekday meal. Which means a healthy and delicious lunch for a few family members. Perfectly reasonable question. This recipe calls for a 3.5-5 lbs sized chicken which is on larger size. The chicken in the photos was close to 5 lbs and took 1.5 hours. While the weight of the chicken will determine the total cooking time, a general rule of thumb is 20 minutes per pound. How to tell if a roast chicken is cooked? The easiest way is to use an instant read meat thermometer. The thickest part of the thigh meat, without touching the bone, should reach 165° F.
Other signs include, the skin pulling away from the ends of the bones, the legs and wings easily pulling away from the body, and the juices running clear (versus pink). 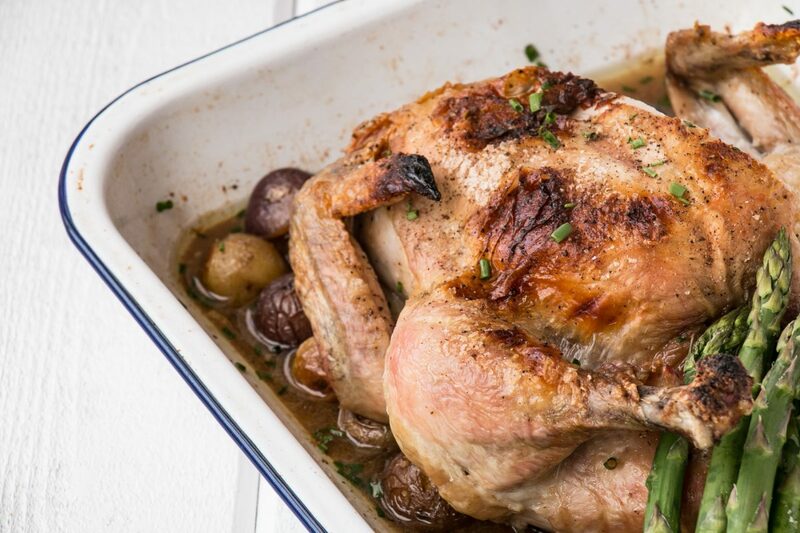 This recipe calls for very little olive oil, because a whole roast chicken will seep quite a bit of liquid including some fat that renders off the chicken. The potatoes and asparagus then cook in the chicken juices. 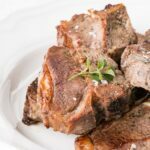 It makes a flavourful almost-gravy without any effort. 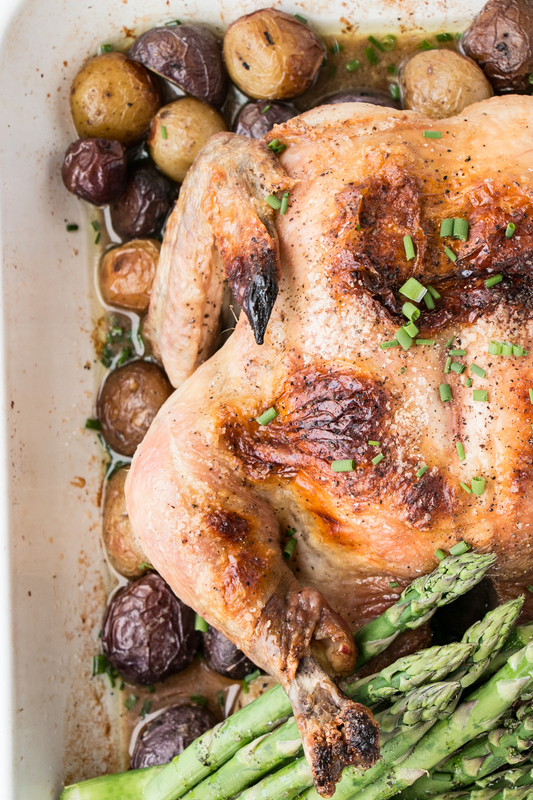 Easy and with almost zero prep, 4-Ingredient Roast Chicken Dinner. 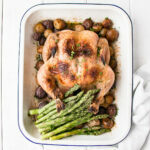 Fail-proof juicy whole roast chicken recipe that lets the oven do all the work! And, it's a one pot meal! Toss potatoes with olive oil in a baking dish. Place chicken on top and season the potatoes lightly with salt and season chicken with remaining salt and pepper. Bake for approximately 90 minutes*, or until the internal temperature of the thickest part of the chicken thigh (without hitting the bone) of 165° F.
Approximately 8 minutes before chicken finishes cooking add asparagus to pan. Allow chicken to rest for 5-10 minutes before carving. * the size of the chicken will determine the cooking length. the chicken in the pictures was approximately 5 pounds and took 1.5 hours to cook. 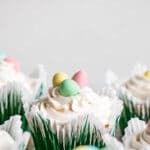 I've been loving recipes like this one with just a handful of ingredients. It makes dinner time so much less stressful! Yes! Quality, simple ingredients can definitely go the distance. Such a comforting meal with very little effort, it's true.